Northern New Mexico residents call the state’s iconic holiday decorations farolitos, while southerners call them luminarias. But all agree that these simple, sand-weighted paper bags, each containing a lit votive candle, light the holidays with warmth and beauty. 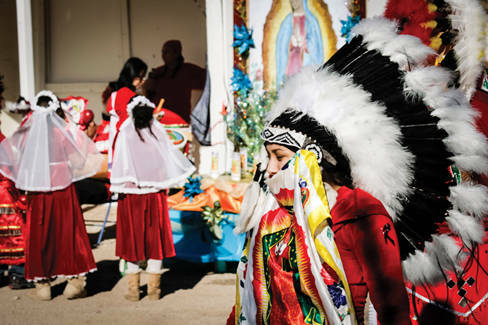 The tradition traveled here from Mexico, where residents lit candles to symbolize Mary and Joseph’s journey to seek shelter before the birth of Jesus. Get into the spirit by making an overnight trip out of one of these unique celebrations. For nearly two decades, the town and state park at New Mexico’s largest lake have celebrated Christmas with a Beach Walk. On December 8, from 5 to 8 p.m., more than 4,000 luminarias will line a path guiding visitors to 25 campsites sponsored by local businesses. At some campsites visitors gather at bonfires to sing carols, at others they sip cider, nibble cookies, and savor posole. At 6:30 p.m., boats decked out in holiday splendor create a floating parade of lights through the marina. All activities are free; the State Park entrance fee of $5 applies. Ashley M. Biggers is a guide-book author and contributing editor at this magazine.